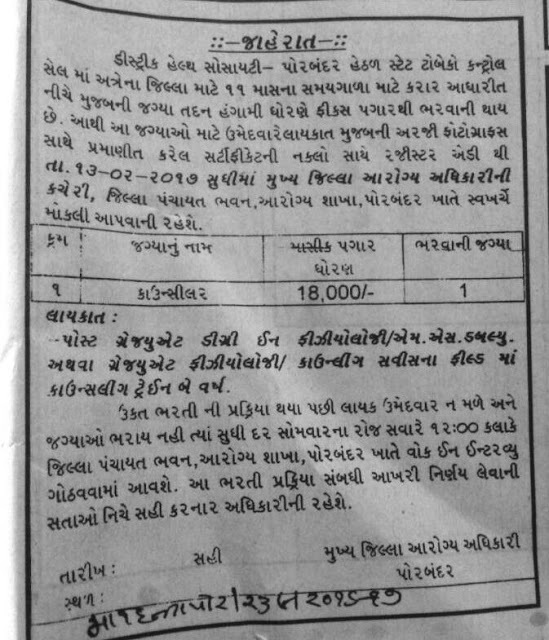 District Health Society, Porbandar has published Advertisement for below mentioned Posts 2017. More information please read below mention details carefully. Educational Qualification : Post Graduation in Physiology / MSW or Graduate Physiology / years of Experience in Counselling Field. How to Apply: Send Applications below mention Address. Address to sent Applications : District Building, Health Department, Porbandar. This work is licensed under a Creative Commons Attribution-NonCommercial 4.0 International License.